The Flat Headed Cat is a very dark reddish brown and most unusual with a long narrow head and flattened forehead. So named for their flat head they are just slightly larger in body than our domestic felines measuring just up to 2 ft in length. They occupy much of the same territory as the Fishing Cat ranging also throughout Southeast Asia living deep in the forest scrub close to rivers and tidal basins. 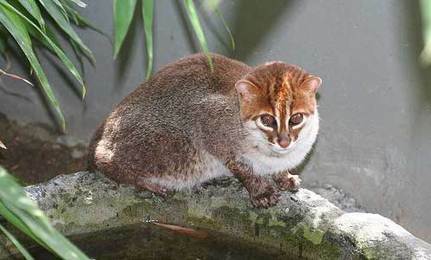 Flat Headed cats are well suited to take up residence in the Palm Oil Plantations of Malaysia thriving in the thick jungle wetland environment also preying on abundant rodents species. If you believe the myth that all cats hate getting wet, then you’ve yet to meet the flat-headed cat. With webbed feet and a streamlined head perfectly adapted for speed in the water, these strange felines not only like the water, they practically live in it. They are also recognized as the world’s least known feline. And unfortunately, they may remain mysterious. According to National Geographic, a new study published in the journal PLoS ONE has indicated that the flat-headed cat’s habitat is rapidly being transformed into vast biofuel plantations. Native to the swampy peat forests of Thailand, Malaysia and Indonesia, the cats are nocturnal, elusive, tiny (they typically weigh between 3-5 pounds) and difficult to observe. There are also only two flat-headed cats in captivity anywhere in the world — both in zoos in Malaysia — so little is known about them. To get an idea of how their population was faring, researchers pieced together scattered records of flat-headed cat sightings since 1984. They also developed a computer model to predict how the cat’s historical population and distribution might be effected by modern changes to their habitat. What they found was shocking. Almost 70 percent of the area that historically provided good habitats for the flat-headed cat has already been converted into plantations, mostly for the purpose of growing biofuel. Furthermore, their remaining range has become fragmented, likely making it difficult for remote populations of the cat to breed with one another. Only 16 percent of that leftover land is currently contained within areas that are protected according to the criteria of the International Union for Conservation of Nature. Thus, with an estimated baseline population of only around 2,500 individuals to start with, it’s likely that the flat-headed cat is in dire straits. The cat’s predicament is not unique in the region where it lives. Tropical Southeast Asia has both one of the highest rates of biodiversity and highest rates of deforestation worldwide. Much of that deforestation is for the purpose of planting palms, a cash crop destined for the biofuel market. Andreas Wilting of the Leibniz Institute for Zoo and Wildlife Research, who co-authored the new study, hopes that new awareness surrounding the plight of the flat-headed cat can help bring about protections for all species threatened in the region. “The next step is to gain further information about the ecology of this little known species and to enforce the protection and thus ensure the sustainability of the key remaining forest habitats,” Wilting said. Thus, the ultimate fate of the flat-headed cat may rest on whether this unknown but charismatic feline can break into the mainstream.